Remember that quince jam I made back in December? Well, this is the pay off for keeping Chris and the hedge clippers at bay last year. 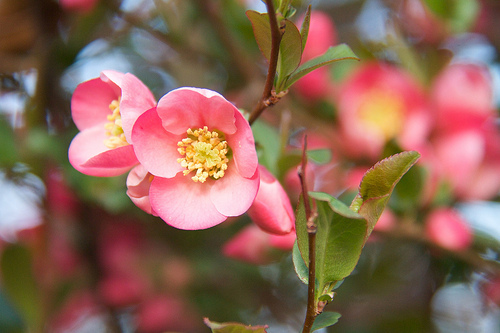 “The Bush” as we refer to it (actually a flowering quince), is still far from a work of horticultural art. It’s currently rather lopsidedly lashed together with some rope to try to give it some support after last summer’s very wet weather caused it to droop nearly flat over onto the lawn. The drooping was almost the last straw for Chris, and I had to work awful hard to convince him that it was something we could address without a major hack job haircut. Its lack of natural core strength is after all the result of our uneducated pruning exercises over the last few years. But this spring we’re finally seeing our patience pay off. It’s flowering in glorious abundance, although not as evenly as I’d like to see, but that will come. I took some photos of my neighbour’s quince, across the street, to compare with (his is red), and for some reason I can’t figure out, the Canon 7D completely blows out intense reds and oranges. I’m looking into this. And I’m not going to post the photos — they look like paint-by-numbers. As you can see, ours is a lovely peachy pink. I also believe my neighbour’s Chaenomeles is the non-fruiting kind. If all these blossoms bear fruit again this fall, I am going to have some serious lawn clearing to do. Last year it flowered only a fraction of this year’s riot, and I had about a 5 gallon pail filled with quinces. I used about 10 to make my jam last year. Maybe I should start taking orders. Previous Post The sad truth about our food? yes, please, do take orders! 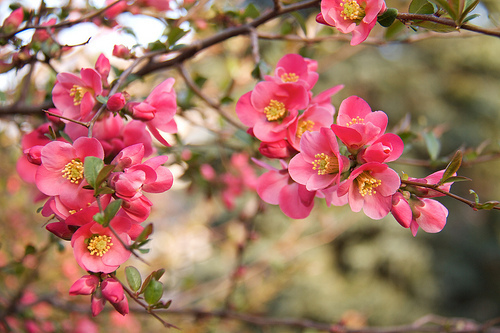 Wow, beautiful blooms… and quince jam sounds heavenly.